Scheda: Nazione: USA-GB - Produzione: Castle Rock Entertainment, Columbia Pictures Corporation, Fishmonger Films, Turner Pictures - Distribuzione: Medusa Film, Medusa Video, Castle Rock Entertainment, Columbia Pictures, Columbia TriStar, Concorde, Filmayer S.A., Finnkino Oy, LK-TEL, Sony Pictures Entertainment, Turner S.A. - Soggetto: dall'omonima tragedia di William Shakespeare - Sceneggiatura: Kenneth Branagh - Fotografia: Alex Thomson - Montaggio: Neil Farrell - Art Direction: Desmond Crowe - Costumi: Alexandra Byrne - Musica: Patrick Doyle - Effetti speciali: The Computer Film Company, The Magic Camera Company, The Moving Picture Company - Formato: Scope Technicolor - Durata: 120' (242'). 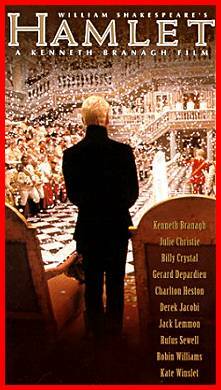 Cast: Riz Abbasi, Kenneth Branagh, Richard Attenborough, Kate Winslet, David Blair, Brian Blessed, Richard Briers, Michael Bryant, Peter Bygott, Julie Christie, Billy Crystal, Charles Daish, Judi Dench, Gérard Depardieu, Reece Dinsdale, Ken Dodd, Angela Douglas, Rob Edwards, Nicholas Farrell, John Gielgud, Charlton Heston, Derek Jacobi, Jack Lemmon, John Mills, Thomas Szekeres, Robin Williams. Trama e commenti: cinematografo.it - kataweb.it - mymovies.it - tempimoderni.com - cinekolossal.com - shortvillage.com - film.spettacolo.virgilio.it: «Branagh ha detto di aver voluto realizzare un Amleto di quattro ore perché la versione integrale facilita la comprensione del testo (ma ne ha montata una di due ore per non spaventare esercenti e pubblico). Il regista rischia di perdersi nel mare delle possibilità offerte dal testo, ma certamente riesce in quello che sembra il suo obiettivo principale: dimostrare che Shakspeare al cinema può avere un forte impatto popolare e spettacolare. 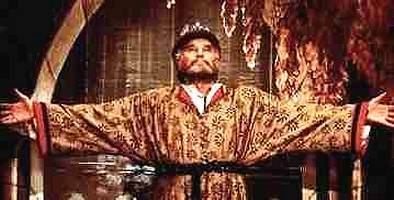 Perciò, se alcuni brani risultano impopolari e statici (il primo dialogo tra Marcello e Orazio) e altri eccessivi (l'apparizione del fantasma, i flashback didascalici), nel contesto delle quattro ore l'operazione acquista un suo impatto curioso, come d'immersione totale in un universo tragico ottenebrato e lucidissimo e in un mondo di riferimenti cinematografici...». 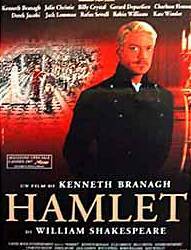 Plot Summary, Synopsis, Review: IMDb - entertainment.msn.com - reelviews.net - moviemail-online.co.uk - everything2.com - tvguide.com: «Whatever Kenneth Branagh's motives for filming Hamlet in its entirety -- recouping his somewhat tarnished reputation as the next Olivier, perhaps -- he's managed to pull off a considerable coup de cinema, and the result is by turns brilliant, lavish, garish and awful. 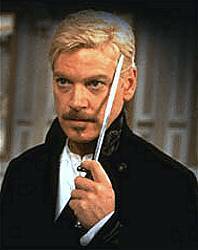 Of course, Branagh himself stars as the Danish prince with revenge on his fevered brain, and he's jettisoned yesterday's impotent brooder in favor of Hamlet the manic, peroxide-blond showman. 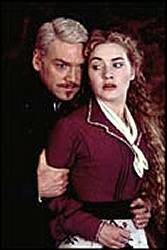 The peculiar thing about Branagh is that while he clearly thinks he wants to challenge his audience -- and a four-hour, unabridged Hamlet is certainly a challenge -- he panders incessantly to the groundlings, hamming it up while downplaying the text's subtitles as if he's uncertain of the Bard's continuing appeal. Or is it the viewer's intelligence he doubts? Expository scenes are crushed under a barrage of visual detritus -- unnecessary flashbacks abound -- and too often the immortal dialogue is either ridiculously dramatized or overwhelmed by the aggressively stirring soundtrack. 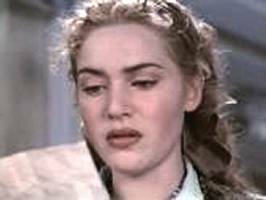 The film is, however, simply gorgeous to look at, and a number of the performances are outstanding, particularly Derek Jacobi as ulaudius, Richard Briers as a not-so-nice Polonious, and Kate Winslet, whose Ophelia is wondrously affecting». Conosciuto anche con il titolo: William Shakespeare's Hamlet.